Another recent post that dealt with my favorite television programs got me to thinking. And that’s not something I often do. “Best TV Satellite System Philippines”: the unfiltered opinion of an American expat in the Philippines. First of all, numerous national and regional cable tv options are available throughout the Philippines. This article will focus on satellite systems available in this land of 7,107 islands. Dream Satellite TV is the first all-digital Direct-To-Home (DTH) television broadcasting service via satellite in the Philippines. It originates from the Dream Broadcast Center located at the Clark Special Economic Zone in Pampanga. In addition, to receive Dream’s broadcasting signals, subscribers must acquire a 60 centimeters (24 in) in diameter satellite dish antenna. An Integrated Receiver-Decoder (IRD) and a Dream Conditional Access Card (Smart Card) is also needed. Dream has plans ranging from 99.99 pesos to 650 pesos. We had a neighbor on our island province of Guimaras who was subscribed at one time to Dream but eventually signed up with Cignal, the satellite provider we have been using for years. Global Satellite, G SAT,is a hybrid subscription and free to air-based direct-to-home (DTH) satellite television service commercially available in the Philippines. G Sat is owned by Global Broadcasting and Multimedia Inc. (GBMI) and First United Broadcasting Corporation. Sky Direct (stylized as SKY direct) is a direct-broadcast satellite television service in the Philippines owned and operated by Sky Cable Corporation, a subsidiary of ABS-CBN. Sky’s entry to the DBS market was hindered by various oppositions from the industry, citing legal issues and the slow growth of the pay TV market in the country. On December 23, 2015, Sky was granted by the NTC a provisional authority to operate and maintain a DBS service in 251 cities and municipalities in the country for a period of 18 months. At present, Sky Direct offers prepaid and postpaid plans with exclusive channels from ABS-CBN and ABS-CBN Cable Channels such as ABS-CBN HD, ABS-CBN News Channel, and ABS-CBN Sports+Action HD. As of October 2016, Sky Direct has gained over 70,000 subscribers. While I’ve viewed SKY Cable television programs as my asawa and I have traveled the Philippines, I’ve never seen SKY DIRECT. SKY’s cable system offers a wide range of foreign and Filipino channels. Cignal (pronounced as signal) is a subscription-based Direct-To-Home (DTH) satellite television service provider in the Philippines. Cignal is owned by Cignal TV Inc., a wholly owned subsidiary of MediaQuest Holdings Inc., PLDT. As mentioned earlier in this article, we have been viewing quality television programs on Cignal for years. As a result of their excellent channel selection, I’ve been quite happy with their service. I recently upgraded from our 830 peso plan (which actually cost us 930 pesos a month, 18.60 US Dollars) to a 1290 peso plan (which costs 1390 a month, almost 28 USD a month.) We get 31 High Definition Channels with this plan in addition to 86 other channels. Because, I have nothing but the highest of praise for Cignal, I highly recommend their service. 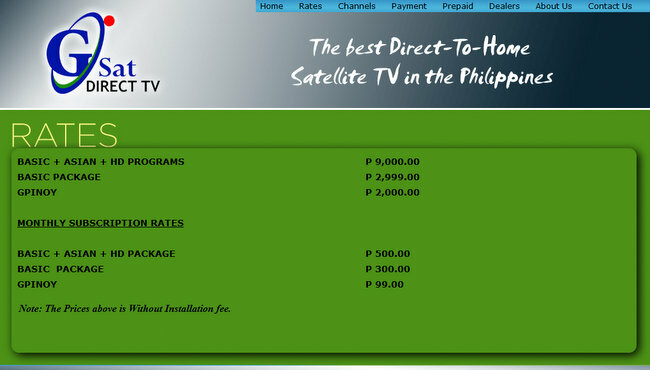 Best TV Satellite System Philippines? Personally, I feel it’s Cignal. Our recent program upgrade went smoothly, I was able to accomplish this feat in less than 10 minutes thanks to the assistance of Cignal’s online help. Excellent customer service. As of September 2015, Cignal reached the 1,000,000 subscribers base target.